Bring the battle to the evil Empire with the Rebel Alliance's super-fast A-wing Starfighter! As featured in Star Wars™: Episode VI Return of the Jedi, the agile A-wing, with an opening cockpit, is perfect for attacking the Imperial Fleet! Build the same lightning-fast ship that destroyed Darth Vader’s Executor! Then, take on the Imperial forces with Admiral Ackbar, an A-wing pilot and Han Solo! This comes down to 33.89 cent per brick. 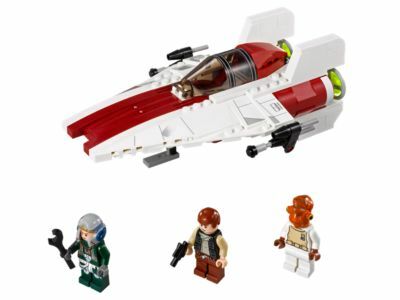 The A-wing Starfighter™ (75003) Lego set is no longer directly available from the sites below. However, 3rd party partners of these sites might still have the set available. Alternate description Battle the Imperial Fleet with the super-agile A-Wing Starfighter™! Go into battle against the Imperial Fleet with Admiral Ackbar, Han Solo and a Rebel pilot in the fierce Rebel Alliance A-wing Starfighter!